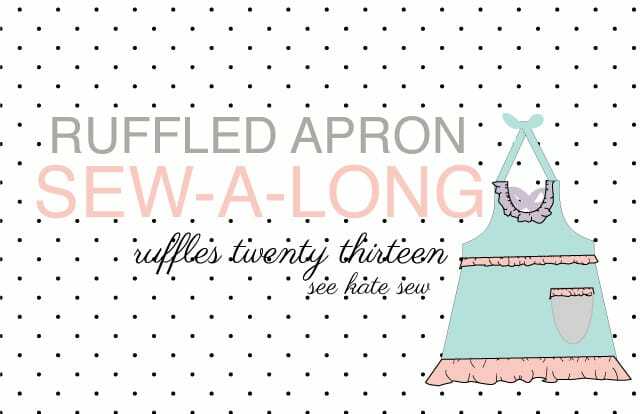 Kate of See Kate Sew has been having a wonderful series full of ruffles on her blog lately. 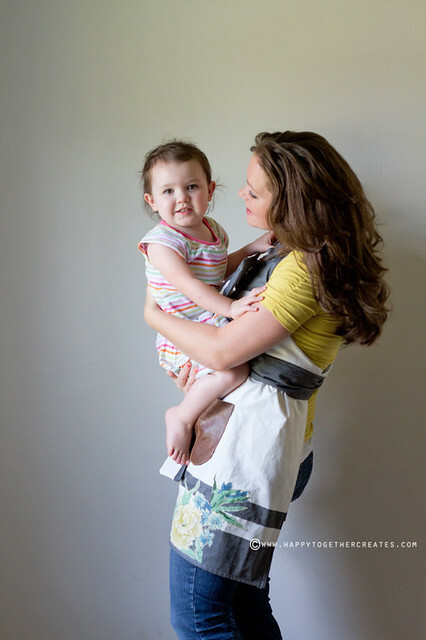 You know, lots of tutorials with things that have ruffles, giveaways, guest bloggers, etc. 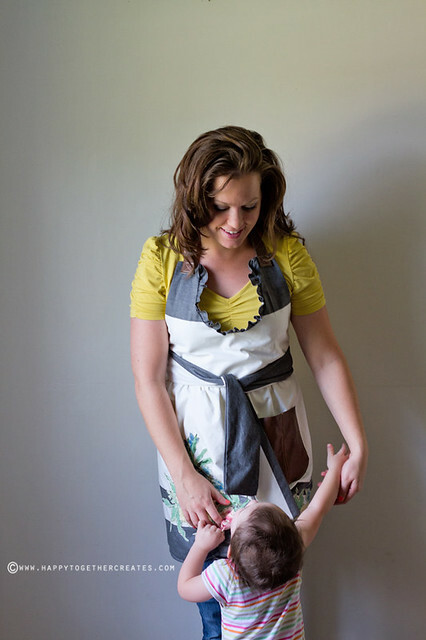 For part of the series, she created a one size apron free for seekatesew newsletter subscribers or for sale in her shop (see details here). And she’s having a sew-a-long for it! 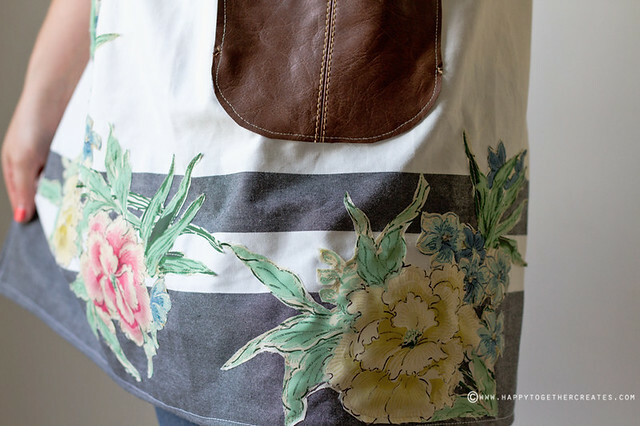 She sent the pattern to a few of us bloggers to mix it up some. This is what I made. I started with this lovely fabric I had bought at Ikea. 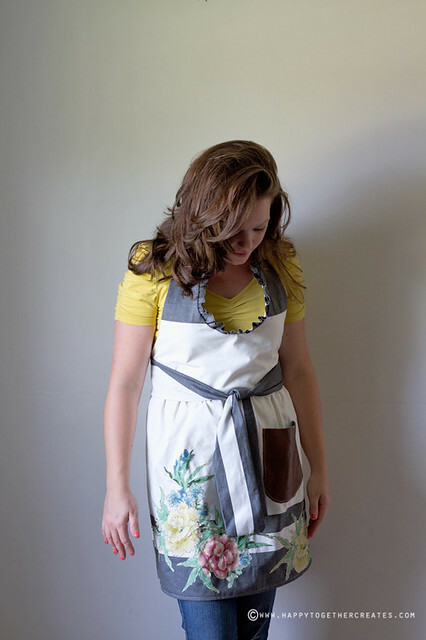 It’s a bit on the heavier side (think tablecloth like), but I kind of like that for an apron. I strategically cut it so the stripes would be where I wanted them. I also used the edge of the fabric that was “sealed” for the ruffle so I would not have to fold it in half since the fabric was thick. And, instead of having fabric straps around the neck, I cut off a purse strap from a purse I bought at a thrift store (see pic below). I also used this purse to create a pocket for the front. 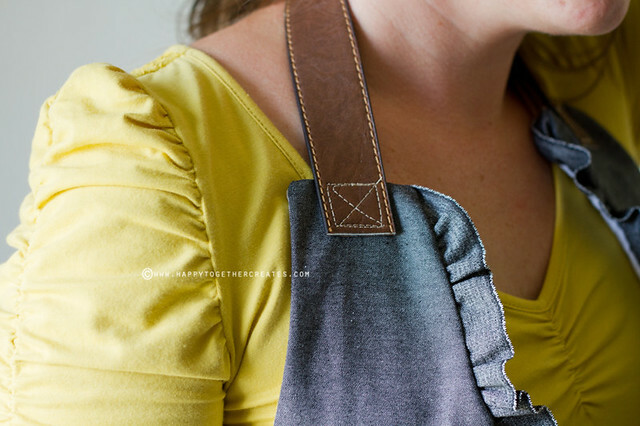 I like the extra texture it adds to the apron. 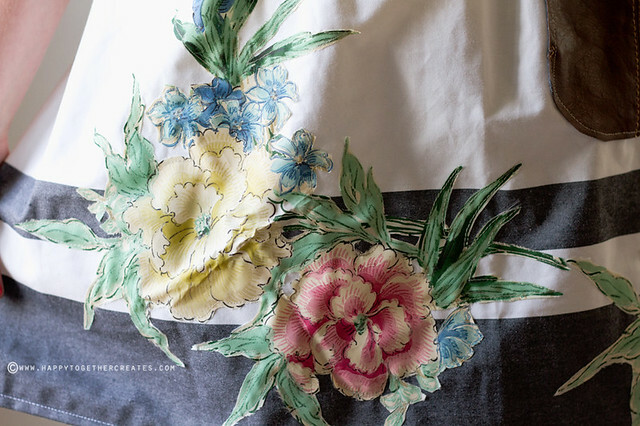 I appliqued these gorgeous flowers on from a vintage curtain panel I have been hoarding for years. Seriously. I had been waiting for the right time to cut into it and it seemed that this was the time. I’m so happy to see them in use! 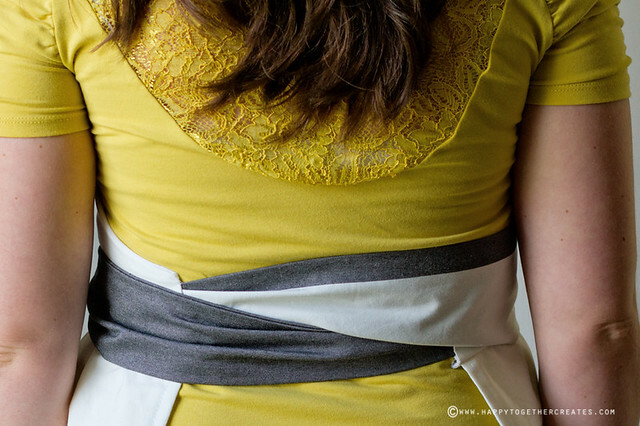 I widened the waist ties a bit, so when I sewed them in place I made a pleat to bring it in. I also decided to tie them by wrapping them around to the front. I would have made the straps longer for this, but I ran out of fabric. And it works good, although I would have preferred a little more length for this. 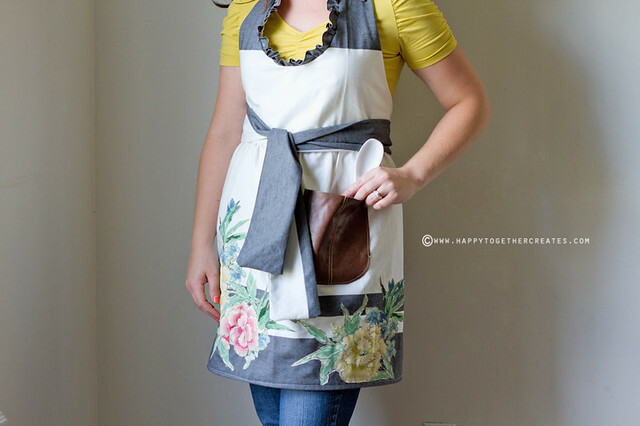 I’m so pleased with my new apron. It was nice to make myself something this time. And it’s totally me 100%! It took me less than an hour to make and would be a great idea for a present. I think I’m going to make one for a house warming gift next for my friend. 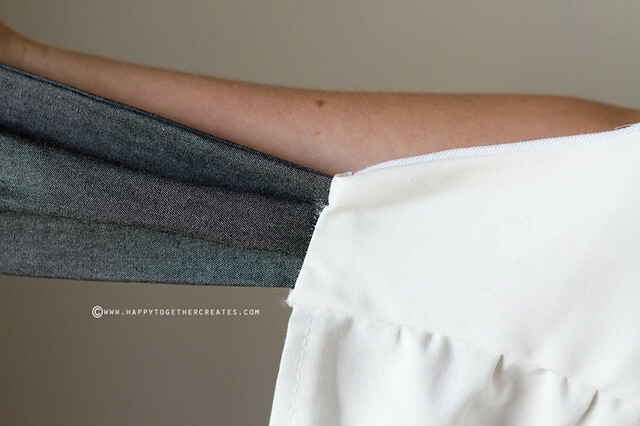 And even though it is one size, you could easily alter it smaller or larger for whatever is needed. Happy sewing! love your creativity. Gives me so many ideas to use those excess things laying around. Gorgeous and inspiring! I am not so secretly wanting to drive to 250 miles to the nearest IKEA to get me some of that fabric. Thanks for sharing! Great job, love your apron! Thanks for sharing lovely pics! Thank you!You are too kind 🙂 Ps….I haven’t forgotten about the cookie cutters and all. There will be a post hopefully soon! This is just gorgeous, you really made it your own and I love all of the elements. Fab pic of your sweet girl there too.